When your child first gets diagnosed with cancer, you're thinking about the now and the near future. You're thinking... "Will they make it until tomorrow?" or "When is the next scheduled chemo?". For a while, I never really thought about our life post childhood cancer. I continuously thought about our life before cancer because I longed for those days, where our worries about sniffles seem so ridiculous now. When she was first diagnosed [i'm talking.. THAT night], we received tons of information about her treatment plan and we had to decide if she was going to be a part of a study or not. We had to make the decision by the next day. Late that first evening we sat together in her hospital room and tried to read through the information. Much of it was foreign language to us. 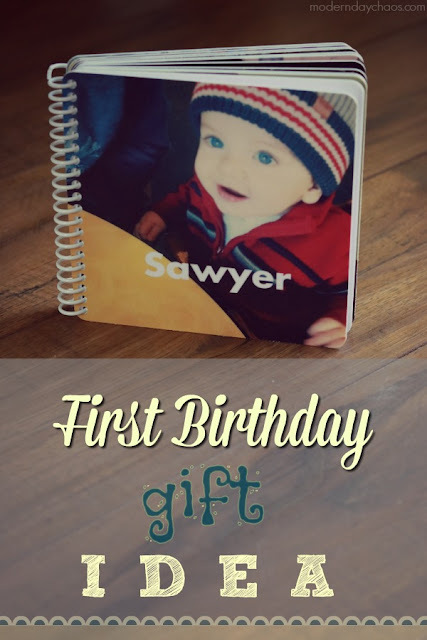 Included in this information was a list [huge list] of most of the medications and chemotherapy she would receive during the 2.5 year treatment plan. It was listed in a simple table over the course of several pages. In one column was the name of the medication and in the other columns included side effects rated by severity and long term adverse effects or complications. This was very overwhelming to read. Although these medications were there to save her life, what about her life after cancer? At that moment, we just wanted cancer free. It's hard, you just don't know how you're child will do with these medications and how it will have an affect on them as an individual. So we pushed those long term effects to the side and focused on the present. This is what we did for a while. There are many factors that will impact the types of late effects the child is at risk for. The type of cancer, age at diagnosis, genetics, use of radiation - all impact the late effects. Kids who receive Intrathecal Chemotherapy [chemo injected directly into the spine] are at a higher risk of learning disabilities. Intrathecal chemo is a staple in treating Acute Lymphoblastic Leukemia. Late side effects vary greatly and it's also hard to tell if things like behavior issues are related to the chemotherapy history or if they were going to occur on their own. It's so important for parents to be aware of these issues so they can be addressed quickly. 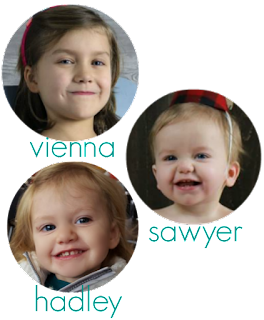 Vienna has her own set of issues that we deal with daily, but we have our child - and that's what matters most. Those toxic chemicals saved her. We continue to help her through her daily struggles and get her the help she needs to continue with a normal life. 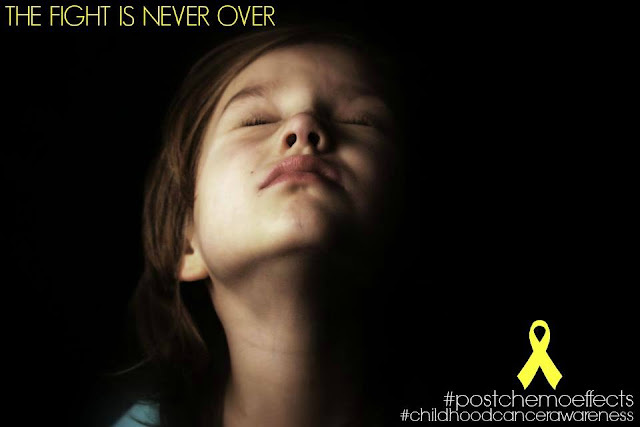 September is Childhood Cancer Awareness month - are you helping to raise awareness? 3 year old Hadley has been eager to do some homework with her big sister. 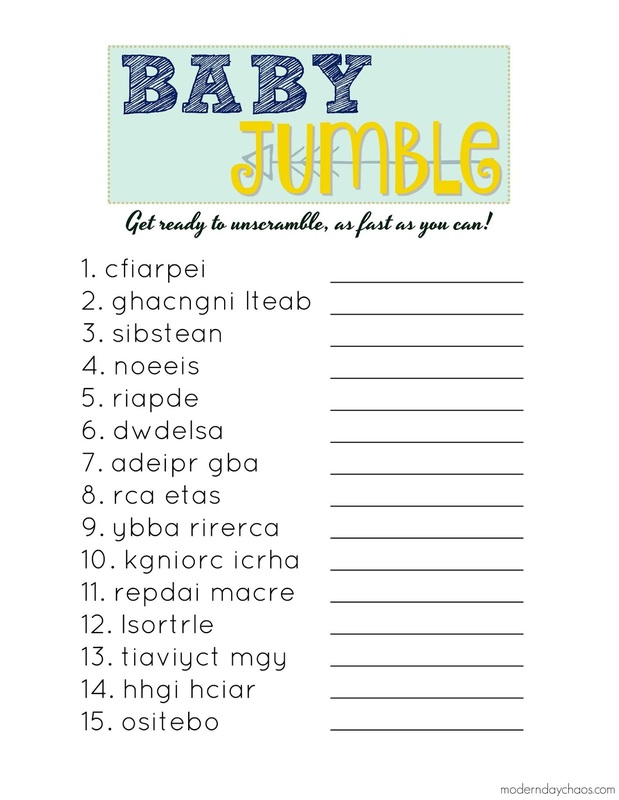 I put together some worksheets for her and she really enjoyed them. Which picture doesn't belong? Fun images for your little one to start off with and learn to choose which picture doesn't belong. The first group of worksheets I put together is for the early preschooler. These are free to download! 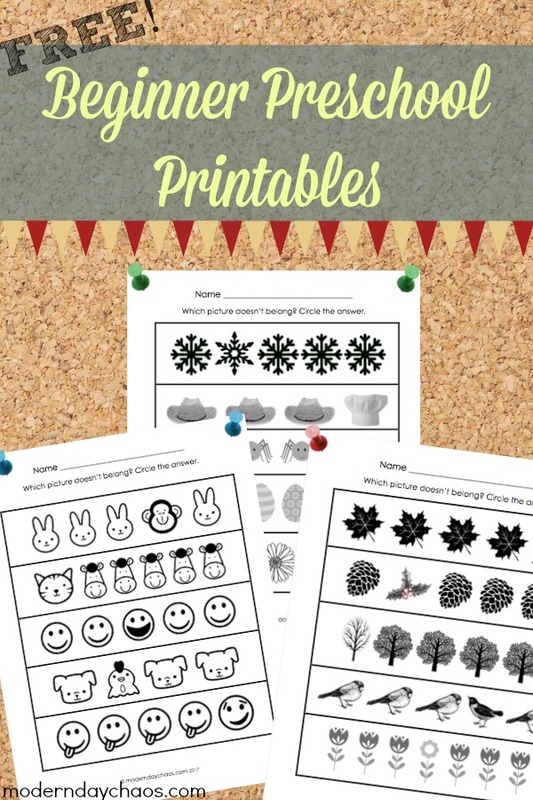 A great addition to your worksheet collection for those just starting out. Labels: DIY, Free Printable, Homeschool, Homeschooling, Preschool, Preschooler, Printables, Which Picture? My frustration has been high lately. It is stemming from the lack of understanding when it comes to Childhood Cancer, specifically childhood Leukemia and treating it. When it comes to Cancer, you can't simply lump it in a group. There are SO many types and factors that effect survival rates. 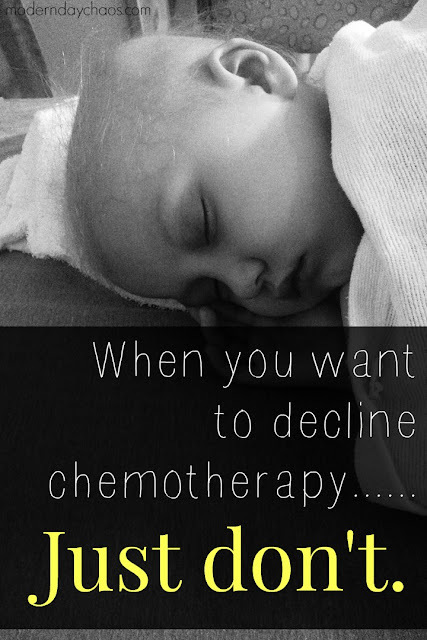 A phrase I keep seeing, especially in natural mom groups, is "I would NEVER use chemotherapy to treat my child if they had Cancer". Why? Because they believe chemotherapy only works in 2% of cases (I see this statistic used a lot) and they believe that they are more likely to die from chemotherapy than of cancer itself. This is infuriating to me. This also shows me they know nothing about what they're talking about. So... let us say that your child was just diagnosed with the most common form of Childhood Cancer - Acute Lymphoblastic Leukemia [ALL]. The first signs of ALL may mimic other child ailments, such as the common cold, the flu, or a stomach bug. Signs include fever [may persist as low grade], general weakness/fatigue, bruising, loss of appetite, or bone pain. A lot of these signs could be attributed to something other than cancer. Excessive bruising, you might just say they had been playing rough. If your child begins to complain of bone pain, you might think they are experiencing growing pains. Because the symptoms of the disease are vague, diagnosis is usually only made months after onset. What actually causes these symptoms? The symptoms of ALL appear due to low blood counts. The low blood counts are a direct result of the cancer crowding the bone marrow [a place where blood is made] and not allowing enough room to form everything the body needs, like red blood cells, platelets, and mature white blood cells. What exactly crowds the bone marrow? Immature Lymphocytes. In other words, very young white blood cells. They begin to reproduce at a rapid rate and take up the much needed space for other blood cells. As the number of mature white blood cells begin to go down, the child has an inability to fight infection and exhibits fevers. When the number of red blood cells decrease, the child becomes pale and weak. Platelet levels will also plummet and as a result the child will bruise easily. Unexplained bruising above the waist should always be looked into. When the platelet levels go down even further, the child will have petechiae. In our case, the petechiae is what set off that something was really going on and we had a diagnosis that week. Often times when petechiae shows, platelet levels are at a dangerously low level. When we finally got blood work for Vienna, her platelet count was 6,000 [normal range 150,000-400,000]. Levels this low put the child at risk of internal bleeding, bleeding into the brain, and death. While we're talking about results, her Hemoglobin level at diagnosis was a 6 [normal range about 12-15]. Hemoglobin is responsible for delivering oxygen throughout the body, so when this number suffers - so does the body. The heart tries to compensate for this by beating extra fast to try to deliver more oxygen throughout the body with the little amount of red blood cells it does have. These levels will NOT recover on their own, the immature white bloods cells (also called blasts) will continue to crowd out room and take over the space that's left to make red blood cells, platelets, and white blood cells. And like I said before, diagnosis usually only occurs when cancer has been present for months already. At diagnosis, these kids typically have critical blood values that need to be corrected quickly. Within hours of her diagnosis, we were already receiving both red blood cells and platelet transfusions. This is a short term solution though, without curing the cancer in the bones - these levels will go up temporarily with the transfusion but then immediately go back down because the marrow can't sustain the levels. So you show up to the ER with your child presenting with these symptoms, they get some blood work, and you're left with an ALL diagnosis. It can happen within hours, it did for us. You never thought it could happen to your child, you did everything right.. mostly healthy diet, cloth diapers, non toxic products, etc. But it did happen to you, and now you have to fix it. When your doctor sees these lab results, they know it's critical and it becomes a mad dash to treat your child before they succumb to the many ways Leukemia can take them [low blood counts or infection for example]. We're talking days, or if caught early weeks, before this can happen. So you said you would decline chemotherapy if your child was diagnosed, well here you are - in the ER with a cancer diagnosis. You have the diagnosis and like you said, you don't want chemo. So you try to take your child home. This will not happen, the hospital won't let it. CPS will become involved and mandate that your child will receive the recommended treatment. Ok - So then you say, "Well I wouldn't even take my child to the ER to begin with". In that case, you actually have no idea what you're dealing with. Is it the flu and you need to ride it out? Or is it Leukemia? Who knows. But if it is Leukemia, your child won't make it very long at home. Both situations don't really work out the way you had intended, but one allows you to at least have a child. If for some reason, somehow, you know your child has Leukemia without a blood test and you want to treat at home, what do you use? I have searched high and low for a story about alternative treatments for ALL, I have not found one successful story. Sure there are great alternative therapies that can be used WITH chemo, but not in place of. The first phase of ALL treatment after diagnosis is called Induction, this phase is only a month long and the goal is to obtain remission. Within ONE month. Besides chemotherapy - what other treatments can do this that fast? None that I know of. Juicing, alkaline diets, CBD oil... those will not induce remission. Every last cancer cell in the bone marrow needs to be gone so that none are left to replicate. These cancer cells can also hide in many places, including the spinal cord. All of these places need to be treated to ensure there are no more cancerous cells left. How do you plan on monitoring your alternative treatment plan so see if it's working? This cancer is fast, you don't have time to dabble in different forms of treatments. Typically once diagnosed with ALL, chemotherapy beings within 1-2 days. There is no waiting, because there is no time. In the 1950's, a diagnosis of ALL was considered a near fatal disease.Without treatment, a child was not expected to live much longer than a few weeks. That all changed when a doctor at St. Jude Children's Research Hospital set out to cure the disease in the late 1960's. Because parents become desperate to keep their children alive when faced with an almost certain death, children with ALL went to St. Jude's in hope of an experimental treatment option. The 60's were definitely a turning point in ALL treatment. At first, a group of chemotherapy drugs [used one at a time] were found to induce remission among these young patients, but it didn't last long and soon [weeks/months] the child would relapse with ALL. Remember what I said above - it's VERY important to get every last leukemia cell to ensure it won't replicate and take over again. How were they going to stop relapse from occurring? One doctor's idea was to use every single chemotherapy agent they had used previously and administer them all at once at the highest possible dosage allowed by the child, over the course of three years. This would be done to completely eradicate every last cancer cell. Sounds very dangerous doesn't it? As we know, chemo has very serious and sometimes fatal side effects. But to be real, kids with ALL had very little chance of surviving, so their parents wanted to try something, ANYTHING, to keep their kids alive. The quote "Desperate times call for desperate measures" is perfect for this situation. After the first group of kids went through this treatment, the new cure rate was 50%, this was groundbreaking. With some tweaking, this is essentially the same treatment protocol that we use today, and now we have more than a 90% cure rate. Read more about finding the cure here. Are you really going to risk an almost 0% survival rate vs a 90% cure rate? Of course you won't know how you'll really feel unless you are in this situation [and I hope you NEVER are] but these are the numbers. I just need you to understand, no matter what your level of "crunchy" is - it's OK to use medical interventions to save your child's life, especially when it is PROVEN to work. PLEASE NOTE: I am not a doctor, just a cancer mom trying to get the word out.